I've backpacked, camped and fished all over the lower 48 states with my family as a kid, and then life happened. I've restarted these activities about six years ago - I dayhike or backpack 2-6 times a month. I am between light and ultralight. I have a hammock system and own a Tarptent. My base weight depends upon season and where I go. The Sea to Summit Stopper Dry Bag (hereafter "the bag") is a new product the manufacturer has introduced this year. The fabric is described as waterproof, abrasion resistant, and UV resistant. The packaging further notes that the bag is durable and will not crack in extreme cold. It is PVC free. The bag has welded seams. The bottom is oval rather than round or square. It's made of 210D nylon fabric, laminated with TPU (Thermoplastic Polyurethane). There is a buckle closure, and the buckle is replaceable; it's made of plastic and has steel pins in each end that unscrew for easy removal. When I removed the Stopper Dry Bag from its packaging and unfolded it, I noticed a sticker on the front of the bag with specific instructions in six languages. It informs me that I should avoid bringing the bag into contact with sharp objects and abrasive surfaces, and to not submerge the bag. I am further warned to use two dry bags when trying to protect electronics. The sticker also says to hand wash the bag with warm water only. The sticker was intended to be removed before use. When I removed it, a fair amount of the adhesive stayed on the bag, and required more effort and some Goo Gone to remove it. The bag I received appears to be in perfect condition - the seams are tightly welded and no blemishes or flaws are evident. Judging from the picture of white water rafters on the packaging, I'd guess the bag is intended to be marketed to anyone interested in water sports. The packaging notes that Sea to Summit is part of the Carbon Neutral program, and encourages me to recycle the cardboard. I will be using the Stopper Dry Bag on backpacking trips, to carry insulating items such as sleeping quilt or bag, down jacket, and other items that ideally should be kept dry. I may also be able to take it kayaking with me. I will be monitoring the durability and, of course, the waterproofing claim of the bag as I use it on winter and early spring overnight trips. 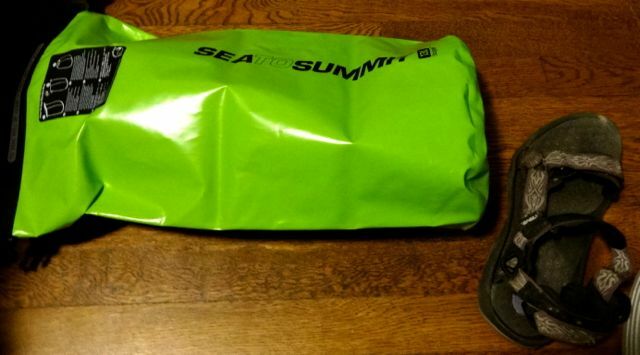 Thanks to Sea to Summit and BackpackGearTest.org for the opportunity to test the Stopper Dry Bag. Please come back in two months when I post my Field Report.